I wrapped up the workweek loitering outside a radio station and thinking about celebrity. You would too if you watched four grown women agree to be pelted with water balloons in frigid temperatures, all for a chance to meet Fantasia Barrino. The 2004 American Idol blew through the Piedmont on a whirlwind media tour Friday and the assignment of tracking her every move fell on my weary shoulders. Beats covering City Hall. As for the women pictured here, they lived up to the agreement, trading in warm body temps and most of their dignity for a few breathy moments with the mini-diva. In the end they got their wish, and probably a wicked cold as well. But the madness really kicked in once the Guest of Honor arrived. Ushered in through a back door, Fantasia joined myself and about thirty others in an on-air booth built to hold no more than four people. 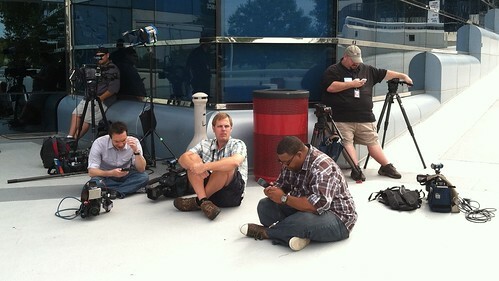 But who can blame the radio staff for turning out en masse? Its not every day a one-named media sensation graced these halls! 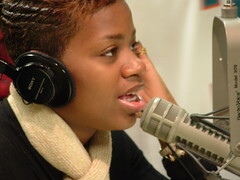 During her struggle with Paula, Simon and Randy, this urban radio powerhouse championed Fantasia’s rise like no other media outlet, except of course my own employers, who recognized the ascendancy of this quirky single mother with the incredible pipes for what it truly was - a gift from the Rating Gods. It’s not often the hottest show on your network plucks a local home girl from obscurity and dubs her the new Queen of Soul. When it does happen, you crank up the hype machine and don’t ask why. Of course for me, the day was filled with hovering on the brink. Poised over my ‘Record’ button, I spent of Fantasia’s visit walking backwards, guessing her next move and hoping I didn’t bash into any walls. Later in the day, when she joined my own stable of broadcasters for a LIVE(!) sit-down on our five o clock news, I rode point, documenting her every high five as the corridors of my TV station suddenly burst at the seams with curious staffers, print reporters and the occasional future stalker. it’s more than a little humorous to see colleagues who pooh-poohed all things American Idol clamor over each other for a chance to get an autograph from High Point’s favorite ghetto-fabulous songbird. I probably shouldn’t have body-checked that little old lady from Accounting like that, but her damn autograph book kept getting in my shot. Throughout the melee, Fantasia herself remained delightful. Unlike many celebs who quickly buy into their own manufactured hype, Ms. Barrino appears relatively unchanged from her meteoric rise - though her bling-bling has certainly taken a sharp upturn from her days hanging out in the mean streets of High Pockets. But unfazed by the rocks that she got, Fantasia welcomed her fans and admirers with open arms. Literally. In the time she spent in my viewfinder, she probably hugged two hundred people - and we’re not talking half-hearted feigned embraces, but arms-around-the-neck sway-back-and-forth circulation-threatening clutches of the highest order. That is NOT the usual way people who grace magazine covers treat adoring strangers. So while I haven’t always been the most enthusiastic arbiter of American Idol, I AM a fan of Fantasia - if for no other reason because she still so closely resembles the inner-city sweetheart we knew her to be a year ago. Now if we could only do something about that British guy in the muscle shirt. ICY OVERPASS - Countless are the hours I’ve spent huddling outside a frozen Live truck and wishing for death. Okay, that’s a little extreme, but camping along some snowy embankment for hours on end can be pretty miserable. You try maintaining a positive attitude when your warm snug anchor team sips coffee in your earpiece as you spread chap-stick on a cracker and call it breakfast. The next time you see some talking-hairdo in a station parka blathering about ‘the white stuff’, think about the poor schlub fighting frostbite to keep all those gadgets running. Then call your local newsroom and demand they stop this insanity before someone gets hurt. Please. THE LONGEST MARCH - One of the most surreal moments I ever experienced occurred in white-out conditions along I-40. A reporter and I were desperately trying to get to the village of Snow Camp to dig out all the clichés waiting for us, when the post-blizzard traffic came to a stand-still. After ten minutes of watching our deadline creep closer, I grabbed the camera and trudged out into the tundra. It was easy going at first, I plodded along briskly on the packed-down snow and grabbed shot after shot of the static line of cars and trucks reaching over the horizon. That’s when the flakes began to fall, fat ones at first followed by pelting sleet. By the time the reporter caught up with me a mile or so later, I sported the kind of frozen snot-cicles not seen since the Age of Exploration. SLIP SLIDIN' AWAY - As a lifelong Carolinian (and reformed DownEaster), I don’t claim to be the King of Winter Driving. But seven years of Piedmont snowfalls have taught me a thing or two about turning into the skid. Be it an ice-encrusted surface street or a completely white winding country road, I’ve learned the hard way how to keep the rolling billboard between the ditches. My particular news wagon is a two wheel drive SUV with a high center of gravity. Driving it on ice is like pushing a high chair across a hockey rink. The Live Trucks aren’t much better, though their massive weight does help things a bit. My very worst encounter involved piloting one of these skiffs up an icy Highway 52 into the Virginia mountains. Going up was a lesson in low-gear grinding, coming back down was a crash-course in bowel control. BOVINES ON ICE - Occasionally the snow-blind assignments aren’t so bad. A few years ago, I spent an incredibly scenic morning with a cattle farmer along the rolling pastures of Highway 62 in Randolph County. The farmer couldn’t figure out why I was there exactly. He just kept shaking his head as he drove his tractor out to check on his cows. I couldn’t really explain either, as the feeding of cattle in the snow holds no intrinsic news value. But that didn’t matter as I blew into my hands and squinted through the frostiest of viewfinder. Between the blowing snow, stoic farmer and hungry cattle the tiny black and white screen at the end of the eyecup looked like a Currier and Ives print come to life. We photogs endure months of ribbon-cuttings and ride-alongs to witness vistas like that. NO-POWER TRIP - Of course the ice storm of a few years back wasn’t quite as pastoral. With my own wife and kids shivering by candlelight, I traversed the region in a quest for Those Without Power. They weren’t hard to find, especially when you learned what to look for. From tell-tale drop cords running under cracked garage doors to the familiar hum of store-bought generators, I mastered the art of spotting the powerless from behind the wheel of my precarious news chariot. Couple that with hunting down power crews on the run and you have the five day blur that was that particular blizzard. To this day, my seven year old gets antsy when the weather man predicts ice, for she will always remember sleeping by the fireplace and wondering why Daddy still has to go make TV. HUNTING FROSTY - One day last year, when a flurry of phone calls boasting unique snowmen blew into the newsroom, I launched a hard target search for these elusive ice effigies. Too bad I only had ninety minutes before show-time to secure my bounty. Realizing I had to move fast to make my deadline, I carried an intern to terrorize along the way. After a couple of false starts, we hit pay dirt (pay -snow? ), encountering snow families, snow dogs and even a conference of snow basketball players, complete with corresponding ACC team logo-wear. But my favorite snow figure was an eight foot ice sculpture of the Virgin Mary. Driving way too fast for the slippery conditions, I almost out the news unit in a ditch when I spotted the snow-white Madonna loitering in the rundown yard. When I grabbed my camera and started rolling, the half-dozen migrant workers responsible for the holy snow-woman poured out of a nearby house and eagerly nodded their approval. When one pointed to his watch with the universal gesture of ‘When will this be on?”, I proudly used all the pidgen Spanish I’d learned over all those college-age Coronas. So what wintry adventures await me this time? I won’t know until I hurl myself into the icy void about nine hours from now. Until then, I’ll be here in my toasty lair, looking for my station parka and wishing I sold stereos for a living. When Jesse Jackson entered the Tarboro High School gymnasium, chaos came with him. Until then, the cavernous space had been one sad soggy lump of displaced humanity. But when Jesse and his entourage poured through those double doors, the vanquished throng of flood victims rose up with swelling pride and a new sense of hope. 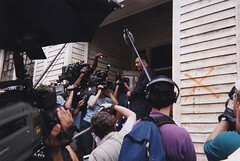 I have recorded many grand entrances in my time behind the lens, but never have I seen anything that comes close to the spell Jesse Jackson cast on the Princeville victims of Hurricane Floyd. But I wasn’t the only one to witness the strange transformation taking place around the man in black. More cameras, sound crews and reporters than I’ve ever seen in one place swirled around the dimly-lit gym, all jockeying for an unobstructed shot of the Leader and his People. Don‘t get me wrong; I‘ve always considered the man little more than an opportunistic carpetbagger, when I considered him at all. In the hours we media jackals waited for Jackson and company to arrive, the biggest question on our cynical lips was what could he possibly do for these poor misplaced souls? As it turned out, the answer was nothing, and everything. As the civil rights activist skirted the edges of the great space, the thoroughly defeated denizens of Princeville rose up to welcome The Great Man. Radiating warmth and assurance, Jackson spoke to the crowd in his unusual singsong cadence while shaking the many hands that thrust toward him. A single mother who had been picking soggy clothes out of a donated pile danced in celebration, lifting her palms to the rafters above and repeatedly thanking Jesus for delivering their prophet. An elderly man who’d just brushed his teeth with a dirty rag now swung the tattered remnant above his head like a victory flag. A young woman, who could do little more than weep, pushed her way into Jackson’s arms. Through it all Jesse comforted the masses through his preaching and mere presence. I only wish I could remember his words, but I was too busy fighting off a crush of cameras, microphones and elbows. “If the media could just step back a little” Jackson said, turning the young woman in his arms a little to the right, to better accommodate the flank of camera flashes. Our afternoon itinerary was typically grueling: Grab some footage of Jackson visiting with the victims in the gym, board a bus that would follow the V.I.P.’s convoy across the river, get whatever sound we could there, then make it back to the high school parking lot - where our satellite truck sat parked among dozens of others, where we would prepare our story for the early evening newscasts. So it was with great haste that I shot as much footage in the gym as I could afford to, before abandoning the surreal scene for a front row seat on the first bus scheduled to leave. When the unmarked buses did pull out, all three were filled to capacity with photographers, reporters, technicians and writers, all clamoring for an unfettered shot of Jesse in the flood zone. Not everyone would get their wish. Located across the swollen banks of the Tar River, Princeville was widely known as a town founded by freed slaves. But when Hurricane Floyd dumped an ungodly amount of rain on Eastern Carolina, the village of 1900 became famous for another reason; as ground zero in the Flood of the Century. As the line of Chevy Suburbans and unmarked prison buses lumbered into Princeville city limits, it was easy to tell why. Car tops barely poked above the receding water, bright orange X’s condemned two out of three homes and lawn furniture hung precariously in the tops of trees. The water may have come and gone but the scars from Floyd’s relentless pounding remained. A hush fell over the bus I was on as the driver negotiated the maze of washed-out roadways. My partner on the trip, Neill McNeill scribbled notes onto a notepad as I stuck my lens out of the rectangular window. Before I could capture all the images I needed, the bus stopped and I found myself lunging for the door. Outside, Jesse and his bodyguards emerged from the Suburban and walked up to the marinated steps of Princeville Town Hall. As the other buses found a place to park, the photogs in my group seized the moment, rushing into the hundred-year-old white wooden building after Jackson and his posse of handlers. Once inside, I managed to squeeze past the other crews, stomping around the condemned space before my eyes adjusted for the lack of light. When they did, I was surprised to see Jackson standing right beside me. Adjusting my shot, I peered through my viewfinder to make sure I was rolling. As if on cue, Jackson bent down and picked up a sopping-wet American flag off the town hall floor, remarking how the American spirit would surely see Princeville through this latest crisis. I worked the focal ring until the flag was crystal-clear in the one-inch screen. Had the ensign not been so incredibly mud-caked and tattered, I’d say one of Jackson’s posse placed it there for him to discover. Instead, I chalked it up to luck and a sharp eye for appropriate props. Uniformed deputies piled through the door, hitching thumbs and looking menacing. Seems the Town Hall was condemned for a reason, and even out of town interlopers and attendant media hounds were not allowed inside. But the gig wasn’t up yet. As Jackson and the crowd made for the door, I stuck with him, unwilling to give up my vantage point as we poured onto the old building’s front steps. It made for a powerful backdrop and Jesse must have sensed it too, for he paused on the small porch to give the media a little Q and A. Still clutching the dirty flag, Jackson took questions from the swarm of lenses he pretended to have no time for. As the microphones and lenses crowded around him, he spoke of hardship and renewal. Which is about the time Neill snapped this photo. It’s become one of my most treasured newsgathering souvenirs. Not because it’s terribly significant, but because the single frame tells so much about that humid afternoon. Look closely. There I am, just to the left of Jackson - back bent, arms hurting, sweat pouring down one squinted eye. Over to the right, a large orange X stretches four planks wide, telling all those who need to know the building is finished. And hanging from Jackson’s grip, the American flag that seemed to be waiting for him and only him. Of course, it’s hard to ignore the crowd of camera operators and sound techs; they take up the frame and set the image’s snarky tone at the same time. Where exactly I fit into all this is debatable, but it’s an argument I rarely bother with anymore. Naaaah, I still think the man’s a crook.